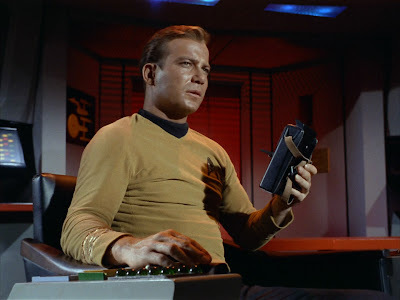 Captain Kirk (William Shatner) records a log in "Dagger of the Mind"
The number of web pages and fanzine articles Star Trek fans have devoted to justifying and explaining the franchise's "stardate" system is incalculable. I won't attempt to step on their toes here; rather, I am interested in the behind-the-scenes history of the stardate system on the original Star Trek television series. Like a lot of promotional material related to Star Trek, this account gives complete credit to series creator Gene Roddenberry, but a little research suggests that the truth of the matter is more complicated. The two men had a few drinks while brainstorming, and soon began chuckling over their imaginative 'stardate' computations. 'We tried to set up a system that would be unidentifiable unless you knew how we did it,' Peeples says. The script originally had dates in it like 2362, and months, and days. I thought that sounded a little awkward for the twenty-third, twenty-second century, so I thought that there should be another dating system. So I checked, that, yes, astronomer's had a way of dating called [the] Julian Day System. But on star date 1312.4 – Astronomers already have adopted a method of dating which makes possible the counting of the number of days elapsed between widely separated observations called 'the Julian Day'. Today July 14, 1965 is 2,438,956 in Julian days. A Julian cycle is 7,980 years, and the Julian day measurement would be scientifically authentic. Suggest “on Julian B 1312.4”. This date would be August 5, 3271. 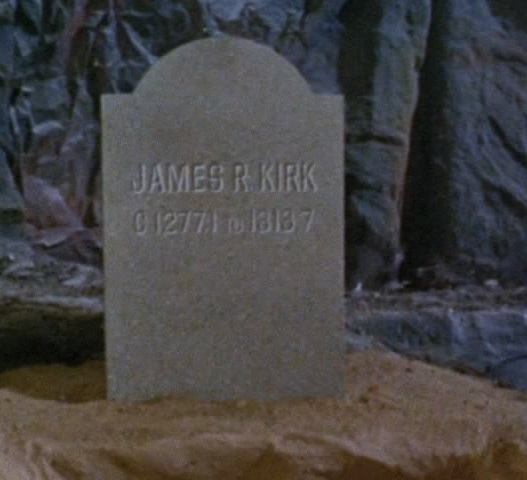 C-1277.1 to 1313.7 – We presume dates are in days, Kirk would only be 36 days old. For conventional dating suggest 3235 to 3271. For Kirk’s birth date in Julian system figure would be in millions. If desired, can be calculated. Although de Forest Research made many script comments that were incorporated into the program, these suggestions were ignored. Roddenberry chose to stick to the stardate terminology rather than name-check the Julian day, and the confusing gravestone markings in the script can be seen on the prop in the finished episode. In short, the stardate system was probably invented by Roddenberry and Peeples for use in the second pilot, not Roddenberry alone. Although the system they designed had similarities to the Julian day system, which was recommended by de Forest Research, Roddenberry was probably unaware of the real-life dating scheme, and de Forest Research's to get the series to abide by its rules were eventually dropped. 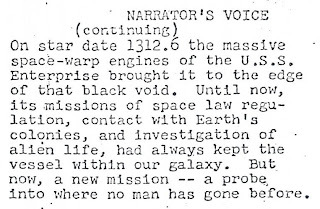 Thanks to TrekBBS user Sir Rhosis for the 'Where No Man Has Gone Before' script excerpts. His script reviews for the original series at Orion Press have been an invaluable resource and come highly recommended. Images courtesy of Trek Core. What about the explanation of stardates in the TOS Writer's Guide, which basically admits that they're random numbers? "Pick any combination of four numbers plus a percentage point, use it as your story's stardate." Welcome to Star Trek Fact Check! This blog is dedicated to untangling fifty years of fact and legend about the production history of the original Star Trek (NBC, 1966-69). It has been recommended by Mental Floss, Neatorama, Den of Geek, and the American Press Institute (twice!). If I have overlooked something or made an error, please let me know. I'm always on the lookout for new insights and alternative perspectives, and do my best to update this blog to reflect new information. My site banner was designed by Raymond Lefebvre, who generously donated his time creating it. Thanks, Ray! Michael Kmet is a writer living in Los Angeles, California. His work has been published by What Culture, MediaScape, and Networking Knowledge, and he has twice presented at the annual Society of Cinema and Media Studies conference. Follow him on Twitter @trekfactcheck. Star Trek Fact Check is an Amazon Affiliate. Star Trek ©1964–2016 CBS Studios Inc. No copyright infringement intended. Awesome Inc. theme. Theme images by sololos. Powered by Blogger.